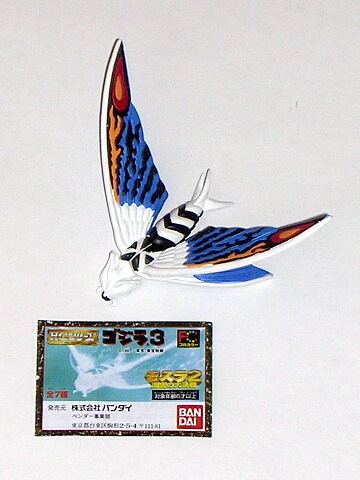 Here is the very cool Gigan 2005 from High Grade set # 11. This colorful vinyl mini figure stands approximately 3 inches tall. Gigan can be transformed into POWER UP GIGAN with his killer CHAIN SAW ARMS!! This figure is HARD to FIND Now! The detail on these HG FIGURES JUST CONTINUE TO AMAZE US! CLAWMARK TOYS WARNING!! Small parts might be hazardous for very young fans under the age of 4. Destroyah from High Grade # 10 set. Awsome detail and color! 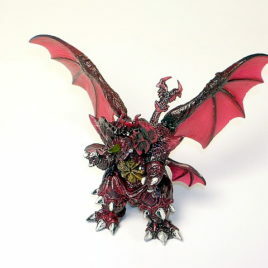 This vinyl figure is approximately 2 ½ inches tall with a wing span of approx 4 inchesl. This colorful Final Form Destroyah comes from the 1995 movie "Godzilla vs Destroyah. Destroya is one mean looking Monster! (coloration and vinyl is different from the Destroyah in the Godzilla Chronicles High Grade set # 3) CLAWMARKTOYS WARNING!! Small parts might be hazardous for very young fans. This beautiful LIMITED Edition set was produced by Bandai for the movie Godzilla Mothra Mechagodzilla Tokyo SOS. 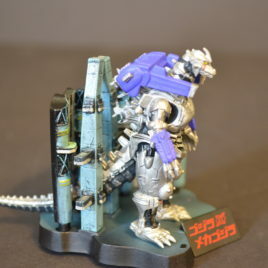 It is a hard to find collector's item that contains a standard sized (8 ½ inch) MechaGodzilla 2004 with BATTLE DAMAGED EYE, a standard sized (8 ½ inch) Godzilla with beautiful ICE BLUE FINS and a highly detailed set of “peanuts” (twin mothra faries) standing approximately 4 inches tall. The PEANUTS are made by “Licca fashion doll”. They are highly detailed vinyl with cloth outfits. (The twin fairies have chains attached to use as KEYCHAINS). The set comes MINT in a MINT colorful COLLECTORS BOX. Scroll down for additional photos.